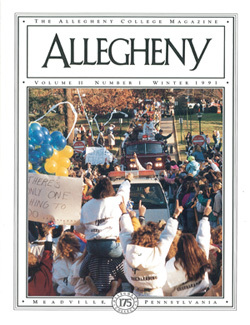 Click here to view a PDF of the original 1991 feature in Allegheny Magazine. Just how big a deal was Allegheny’s 21-14 upset of Lycoming in the Amos Alonzo Stagg Bowl, bringing the College its first-ever national football title? Athletics Director Norm Sundstrom called it “the greatest athletics achievement in Allegheny’s 175 years,” and Sundstrom coached Allegheny’s only other NCAA title-winning team, the 1983 golf squad. Plenty of evidence supports Sundstrom’s claim, from the style in which the Gators won the game to reactions elicited locally and nationwide. The Gators’ electrifying come-from-behind, overtime win was perhaps the only fitting final chapter for their storybook season—just one last test of their character and incredible will to succeed. The underdogs in each of their four NCAA playoff games, the Blue and Gold nonetheless turned back the likes of defending champion and top-ranked Dayton to reach the title contest. They were 9-0-1 on the regular season, but back in August were picked to finish a distant second in conference—let alone national—competition. The contest, televised nationally from Bradenton, Fla., was “the most exciting game we’ve done all year,” according to ESPN College Football Producer Brian Williams. For the few Allegheny faithful who missed the game, quarterback Jeff Filkovski ’91 hit tight end Kurt Reiser ’93 with a 15-yard touchdown pass on the Gators’ overtime possession, then cornerback Tony Bifulco ’92 ended Lycoming’s turn with the ball with a fourth down-and-long interception, set up by a stunning second-down sack by linebacker Darren Hadlock ’92. Allegheny forced the overtime by battling back from a 14-0 halftime deficit on 16- and 12-play scoring drives covering 72 and 73 yards. The first drive was capped by a 10-yard Filkovski touchdown run late in the third quarter, while the second score resulted from a seven-yard Filkovski pass to Julio Lacayo ’92 with 1:38 remaining in the game. Steve Boucher ’91 kicked the critical extra points. Halftime adjustments by the offensive line and defensive unit—both technical and emotional adjustments—meant new-found running room for tailbacks Jerry O’Brien ’91 and Stan Drayton ’93, improved pass protection for Filkovski, and near-total containment of Lycoming’s potent offense. The response back in Meadville to the Gator win was immediate and enormous. Hundreds of students jammed North Main St., re-routing traffic and covering trees with streamers, then tore down the east goalpost at Robertson Field. One observer noted that few rest rooms anywhere on campus could have escaped severe tissue-stock depletion. On Sunday, thousands more fans from the Meadville community, many moist-eyed with pride and joy, lined a parade route the length of town to welcome back the team. Some dozen police cars and fire trucks escorted and carried the Gators to a rally in front of Brooks Hall, where upwards of 500 students, parents, faculty, staff and other friends cheered Sundstrom’s presentation of the championship trophy to the team. Following the game in Bradenton, after emotional celebrations on the field, an estimated 600 Alleghenians had gathered at a nearby Holiday Inn in further recognition of the Gators’ achievement. Some fans had driven all night to reach Bradenton’s Hawkins Stadium, while others had flown cross-country. Those in Bradenton included those Gator players not permitted to suit up for the game because of the NCAA’s roster limit in post-season play. They were flown down by the College. Elsewhere, Alleghenians gathered specially for the ESPN broadcast, or they carefully tracked the Gators’ performance through other media coverage. Most observers noted how much respect the Gators were earning, players and coaches alike, for both the Allegheny football program and the College as a whole. And Sports Illustrated senior writer Doug Looney, in “More Than a Win,” an article about the championship game that appeared in the magazine’s Dec. 17, 1990, issue, wrote, “Last Saturday’s game was a classic example of college football as it was intended to be.” A Sports Illustrated researcher working with Looney on the article called it the most positive story he had read about college athletics in the three years he had been with the magazine.